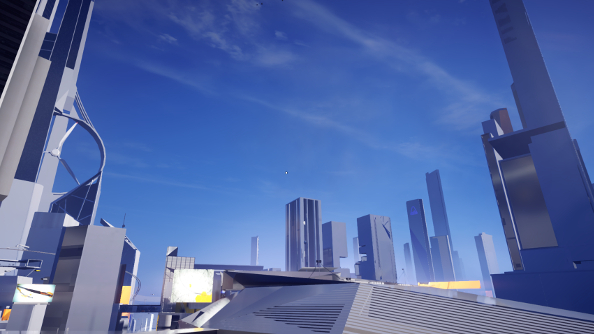 Mirror’s Edge Catalyst’s beta – running from April 21 until April 26 – has left me a bit breathless. I feel like I’ve just run a marathon. Actually, scratch that. I feel like I’ve just jogged down the road, which is a lot like how healthy people feel after a marathon. It is a game of chases, races, and using every surface available to run, climb and bounce across a huge, pristine City of Tomorrow™. I haven’t moved from my extremely comfy chair, of course, but protagonist Faith’s laboured breathing, deadly falls and leaps of faith make it easy to forget I’m an out-of-shape man munching on crisps smeared with a cheesy powder. It’s simultaneously energising and exhausting. 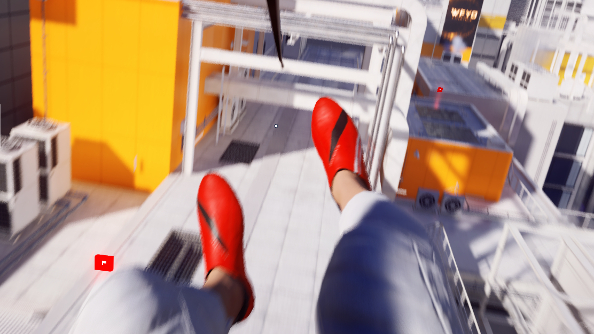 And it’s absolutely the most fun I’ve had using parkour in a videogame. Catalyst is one of the many upcoming PC games that have stolen our attention. 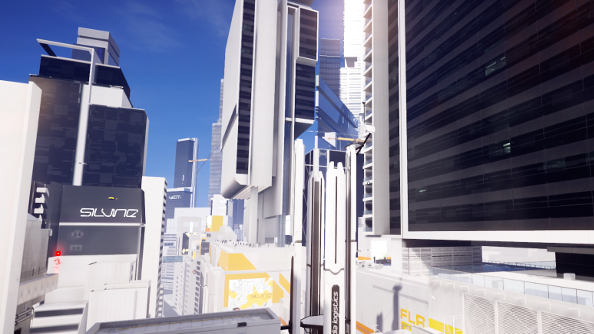 Mirror’s Edge Catalyst merits the open-world treatment perhaps more than any other game. Strip away the trite dystopian narrative and the combat, and it’s a game about traversal and picking the best routes to get to where you need to be in the shortest time possible. With the city now open, it’s a huge parkour playground, and those potential routes have expanded to fit such a large area. Getting to an objective is a puzzle where actually reaching the marker is only a small part. As you sprint across roofs, options appear every second. Do you jump? Do you wallrun? Do you go under an obstacle or over it? Does you follow the big red trail that represents the Runner Vision – the SatNav of the future – or make your own route? I know some of you might be sitting there thinking that choosing between running along walls or leaping across buildings doesn’t sounds amazingly exciting, but maybe that’s because you’re imagining yourself just standing around scratching your chin. You won’t actually be doing that, because you’ll be in the middle of sliding down the side of a building, sprinting through gunfire, outrunning a helicopter or trying to get to your objective with only five seconds to spare. And that’s when you’ve got to decide where to go next. Ultimately, the best path isn’t always obvious, or the one the game picks for you. It might be a longer route that avoids confrontations with the armoured security grunts that occasionally stand in your way, or it might be the one that has the fewest obstacles that risk breaking Faith’s flow, her blistering forward momentum. It could be worth risking a run-in with enemies, though, as you can barrel through them without breaking Faith’s pace. Figuring that out is one of the best parts of the game, and it offers up many opportunities to do that. See, the open-world and freedom to explore means that you aren’t just bouncing from level to level – you’ll run through areas over and over again as you get to and from missions or try to beat your last time in a trial, and you’ll become familiar with them, not just Faith’s parkour abilities. You’ll know the best ways to get across these places because you will have already experimented and tested yourself. How you interact with different areas can change depending on the mission, too. If you’re on the run, being hunted down by choppers and armed enemies, what routes you’ll want to take will change as well. And you’ll also discover that all of those surfaces, poles, railings and obstacles can be put to good use taking out foes. Combat, and what a lovely surprise this was, is pretty fantastic. 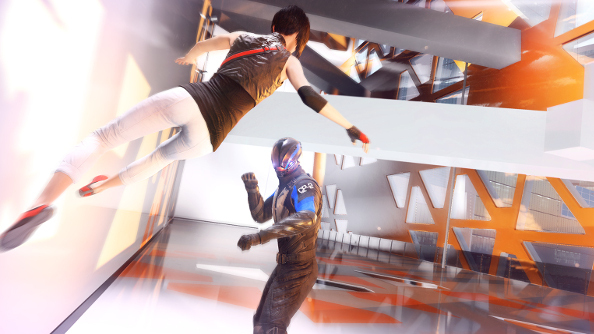 Like all of Mirror’s Edge Catalyst, fighting is best done on the go. You can use your momentum as you’re falling, sliding and leaping to lay down some hurt on those company goons, smashing through them as your refuse to slow down. Instead of combat awkwardly inserting itself into your freerunning shenanigans, forcing you to stop doing all the fun stuff and instead faff around with a flailing or shooting foe, it becomes a brief obstacle that adds variety and badassery to your rooftop sprint. It’s possible to get into a proper fight as well, where you pause your journey for a moment to smash some faces. This does, however, also gives you time to notice that enemies in Catalyst are embarrassingly stupid, or at least the ones present in the early parts of the game. They are slow, never work together despite almost always being in groups, and are about as effective at chasing a criminal as a potato would be. They just aren’t a threat at all. Faith’s superhuman powers don’t make their job easy, I suppose. Faith is, to the best of my knowledge, not The Flash, but she can still somehow dodge fists and bullets like the Scarlet Speedster. It’s weird, in the context of the game, but it’s something I can completely get behind. Maybe she does have superpowers. Who knows? The important thing to note about the combat is that it mostly involves making enemies knock into each other or things, and also fall off things, which are obviously some of the most cathartic things you can watch. Most of my concerns have their roots in one place: while the open-world structure is certainly a great fit for Catalyst, the genre brings with it a great deal of baggage – and those bags are packed with familiarity here. An RPG-lite progression system? Check. A multitude of regurgitated missions? Oh yes. More things to collect than a human could realistically care about? All the things. It’s very conservative. However! Simply getting from A to B, which is what most of the side missions and collectable hunts ultimately involve, is the most interesting part of Catalyst. It’s where all the action happens; it’s where you kick down doors, smash through windows, push gun-toting idiots off roofs and unleash those fancy parkour skills. The impetus to do all of these things is often terribly mundane, but the activities themselves are just excuses to explore the world in greater detail, learning the fastest routes across the rooftops, trying to pull off especially tricky moves. I want to explore that world more, too. The city is a striking dystopia of stark white towers and gargantuan billboards, peppered with bright colours created by the Runner Vision. I want to spend more time experiencing that liberating freedom, where the only tool I really need is agility, and it can take me anywhere. After the beta runs its course, we’ll have to wait until June 7, unfortunately, as Mirror’s Edge Catalyst has been delayed.